A new ethics opinion from the U.S. obstetrician’s organization makes it clear that a woman’s right to say “no” in her medical treatment is paramount, and takes precedence over concerns about fetal well-being. The committee urges doctors to respect “fundamental values, such as the pregnant woman’s autonomy and control over her body,” and discourages them “in the strongest possible terms” from the use of coercion and court-ordered threats or interventions. This is critical at a time when doctors, hospitals, and judges regularly co-opt women’s decision-making in pregnancy and birth, as documented by multiple court cases around the country (Turbin vs. Abbazzi, et al. in California, Dray vs. Staten Island Hospital, et al. in New York, Switzer vs. Rezvina, et al. in New Jersey, Malatesta vs. Brookwood Medical Center, et al. in Alabama [Ms. Malatesta’s own story is here]–all of which are in progress now, except for Switzer, which was resolved in late 2015) and by widespread reports from women themselves, such as were compiled in firsthand accounts here (see Exhibit B in the embedded PDF about halfway down the page), here, here, and here. In September 2015, consumer advocates wrote a letter to ACOG asking them to address the issue of disrespect and abuse in maternity care. From deposition of Dr. Natalia Rezvina, Switzer vs. Rezvina et al. Indeed, the safety of the baby is very often cited when women are harmed with forced interventions, including in the court cases listed above. 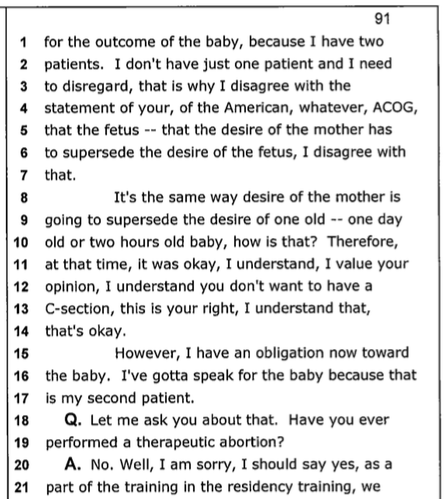 In Ms. Switzer’s case, the doctor said in deposition that she had “two patients” and asserted that she (the doctor) must speak for the “desire of the fetus” (see page 91 in file titled “Natalia Rezvina’s Deposition: ‘I do not agree with your American, whatever, ACOG,’” here). Ms. Switzer and her lawyers maintained that there was never an emergency and her written consent for Cesarean was given under duress and threat of involvement by “legal people” and social services. 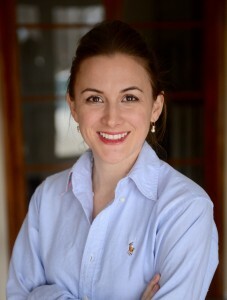 Lawyers for Staten Island Hospital in the Dray case went so far to claim that women do not have due process rights in childbirth in the case of an “emergency”; however, that defense team called it an “emergency” that Ms. Dray was having the vaginal birth after Cesarean that she and her doctor had planned all along. 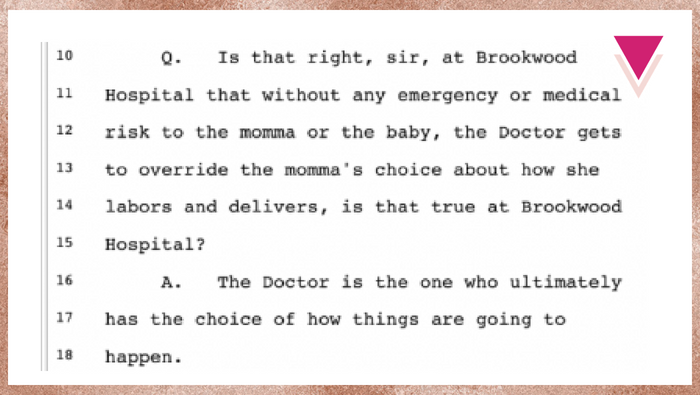 In Ms. Malatesta’s case, her attending doctor (not named in the lawsuit, and not present during the alleged physical battery she experienced) stated that he believed the physician, not the mother, had the “ultimate choice” in childbirth–even when there was no emergency. From deposition of Dr. William Huggins, Malatesta vs. Brookwood, et al. Below are some highlights from the Committee on Ethics’ Committee Opinion Number 664, “Refusal of Medically Recommended Treatment During Pregnancy” (June 2016), which replaces Committee Opinion Number 321, “Maternal Decision Making, Ethics and the Law” from 2005. (See Birth Monopoly’s #ACOGethics for other ethics committee guidelines that apply to pregnant and birthing people.) Please note that, although committee opinions such as these may be used as evidence in court cases, committee opinions do not carry the weight of law. 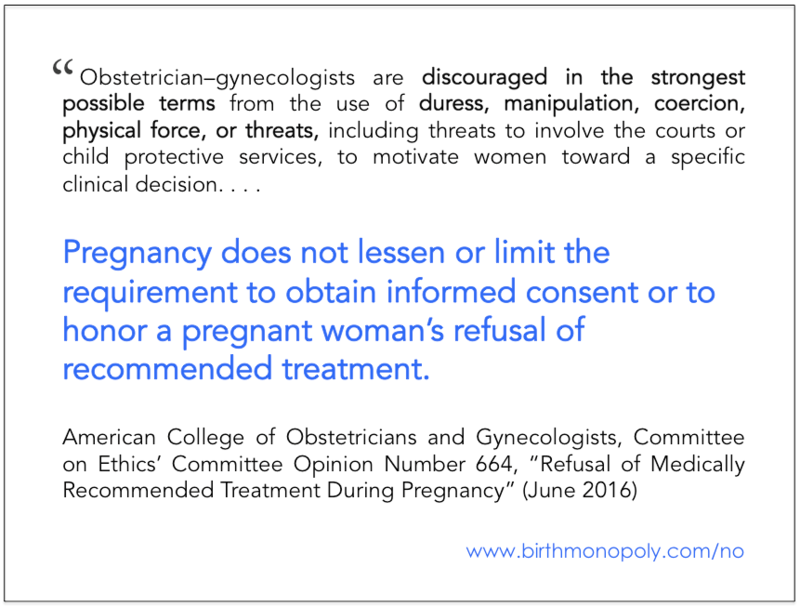 The committee then addresses “Directive Counseling vs. Coercion,” instructing OBs to participate in the former only–calling coercion (the use of force or threats to compel someone to do something) “ethically impermissible but also medically inadvisable” and “never acceptable” for obstetrician/gynecologists. It also acknowledges limitations on the certainty of medical outcomes and knowledge. The committee discusses “Arguments Against Court-Ordered Interventions” as abuses of power and encroachments upon the pregnant woman’s rights, autonomy, and bodily integrity that often disproportionately affect women of color or of low socioeconomic status. It notes 1987 and 2013 papers showing that most cases where court orders were sought involved women in these two groups; the 1987 paper also showed the medical judgment had been in error in almost one-third of the cases. So what does a doctor do when a pregnant woman refuses his or recommendation for a medical treatment? The committee advises them to carefully note the woman’s refusal in her medical records, including documenting the informed consent discussion (risks, potential benefits, alternatives) and the refusal of consent and reasons for the refusal. Under the heading “Process for Addressing Refusal of Medically Recommended Treatment During Pregnancy,” the committee lists a number of steps to guide physicians through understanding and engaging with their patients throughout the informed consent process. Box 1 outlines the “RESPECT Communication Model,” one tool that can help physicians engage in meaningful communication with their patients, even when time is short. 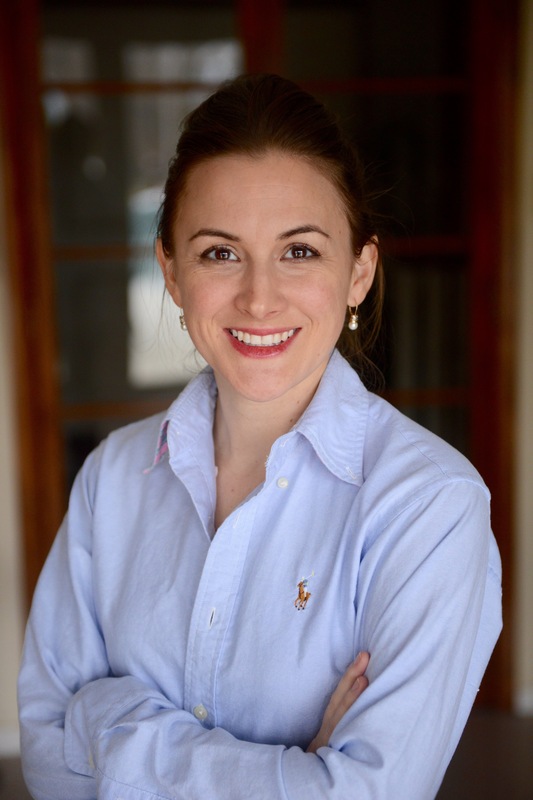 This opinion is an excellent resource, but consumers, advocates, and physician champions must continue to address the disconnect between the ideals it expresses and actual maternity care practice. What can we do to further awareness and education among medical professionals, as well as providing protections for women who do experience coercion and forceful interventions? This is huge, but many OBs do not recognize ACOG as a standard of care setting body in this although they are quick to cite ACOG’s position on home birth when denying women this choice. However after this statement, it will be interesting to see what ACOG does with respect to their out of hospital birth policy. Yes, I’m afraid you’re right. As I have said time and time again, midwives have rules that are created by obstetricians. Obstetricians have optional guidelines, created by their own lobby group. However having said that, I’m pleased to see that more places are addressing this issue. I suspect that the best way forward is an awareness campaign aimed at women rather than at surgeons. And I have very little doubt that more women have read this than obstetricians. We need women to stop believing the healthy baby lie, to start to see themselves as a part of the equation. I’m looking forward to the day when home births or birth center births exceed hospital births in the US! As a physician I have been told time and again that if I do something which is against ACOG recommendations and it specifically goes to court (patient suing me), then I am sure to lose. so even those who don’t really recognize ACOG may come to. For good or bad. The part you left out is that if a patient specifically declines a procedure, following you providing an informed basis for her decision, you will not be liable. Thank you so much for your hard work and bringing this ACOG opinion bulletin to our attention. ACOG needs to go further, and censure somehow the doctors that get reported to them for violating these standards over and over again. AcCOG doesn’t have a complaint process for Physicians. I just tried to complain to them because a fellow of the ACOG was the on call doctor for me and he had me taken to the OR for a C-section against my request and did not even bother going over my informed consent document. The nurses got my signature 7.5 hrs earlier so nobody cared about or documented that I changed my mind and requested to do a VBAC.